Job and Career Services is a collaboration between Advising Services, Counseling Services, eLearning Services, and Workforce Education. We strive to support students with career development and readiness for the future. 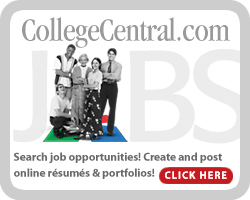 Follow the College Central link below for Shoreline Community College’s online job board that allows students to create online portfolios, build resumes, search for jobs, and apply for positions. This board brings local area employers to our Shoreline student, alumni, and community job seekers. Join us for workshops, activities or just to find out more!